Preheat oven to 350 degrees F (175 degrees C). In a small bowl, blend olive oil, honey, Dijon mustard and ginger. Brush salmon fillets evenly with the olive oil mixture. Place in a medium baking dish. 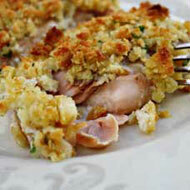 Bake 15 to 20 minutes in the preheated oven, until the fish flakes easily with a fork.